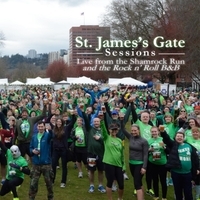 High-energy Celtic Rock-n-Roll from Portland, OR that mixes traditional Irish, originals and pub singers in both studio recordings and a live performance in front of the 35,000 strong Shamrock Run. Slainte'! The Sessions album is the fouth release by St. James's Gate, based in Portland, OR. The band is known by many from the numerous live performances held all over the Northwest. This particular concert held over the St. Patrick's season in 2014 represents a great overview of the wide diversity of musical offerings this group of musicians can provide. As a quintet in this combination, the sound is both full and dynamically diverse - adding lap-steel guitar to the blazing fiddle work, soaring vocals, guitar and a dead-solid rhythm section. St. James's Gate flexes through a broad array of styles, songs and emotions with this release, and shows why the band, now in its 15th year, still continue to headline concerts and festivals that demand quality musicianship, and high-energy and fun. The 2014 Shamrock Run registered over 35,000 participants for a day of fitness and of course beer at the finish line held at the Tom McCall Waterfront Park, in downtown Portland, OR. St. James’s Gate has many strengths, but none more so than the teamwork of all of its musicians – each bringing their own unique talents to the fore – especially in performance. Singer and guitarist Cronin Tierney provides not only some stunning vocal performances both live and in studio, but solid guitar work and some exciting originals as well. The lead track, You and Me, showcases Cronin's outstanding songwriting skill, and a real knack for a hook. Fiddler, mandolinist, vocalist and tambourine madman, Griff Bear shows his diversity as an overall accomplished musician but also as an outstanding soloist and arranger as on Five Miles from Town. Griff is consistently a focal point for the audience with his passionate performances and joy in the sharing of his gifts. Joining the group most recently is Dylan-Thomas Vance, providing thoughtful and engaging lap-steel and guitar skills, as well as his vocal prowess on songs like the Irish mouthful; the Rocky Road to Dublin. Dylan's ability to merge from a variety of styles and complimentary solo work against the fiddle provide a uniquely "American Irish" sound to the band that whips crowds into a frenzy. Holding the fort is Dennis Elmer on the drums. Dennis provides a steady clock to a wide variety of styles, often ranging in different meters, jigs, reels such as The Cullbacky Hop or a power ballad like the Carrickfergus. Loved by vocalists and musicians alike, Dennis is a steady constant whose experience shows in his percussive choices that both support and compliment the songs. The driving force and producer of the album is Matthew Rotchford, performing on both electric and acoustic basses, vocals and serving as the band's resident cat-herder. Matthew's comfort between numerous styles like the soulful Into the Mystic or his original composition Liam's Jig, show throughout the recordings whether within the studio or in live performance. Matthew joyfully holds the reigns with Dennis as the StJG rhythm section supports these artists in making the songs the absolute very best they can be. St. James's Gate is a fun band to play in and it shows. How fitting that this latest St. James's Gate album is called Sessions as a session in the Irish tradition is a most joyful occasion. It is one usually spent amongst friends both old and new, one where dancing and drinking are encouraged, and one where at times the music can touch your heart or even make you cry. St. James's Gate provides that here - a session to which all are invited - an insight to their craft and to the joy and the heartache that these musicians share through their musicianship. By the end of these Sessions, you have made some new friends and we hope, we have made a meaningful connection with our listeners. By capturing the joy of live performance at the Shamrock Run and the focused work of the studio efforts at the Rock n' Roll B&B, St. James's Gate has provided you with over 17 tracks of pure joy. So please, join us dear friends, join us for these Sessions and Ride On.